The memorial in Derry's Bogside with the names of those killed on Bloody Sunday. 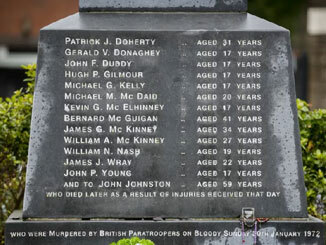 The decision to charge just one soldier for Bloody Sunday – when 14 people were killed and others seriously injured – is a democratic outrage. It effectively extends the long cover-up which has continued over decades to protect senior officers of the British army and the political fiction of Britain’s ‘peace-keeping role’ in Ireland. It is extremely important to the army chiefs that orders to commit illegal acts, such as the murder of unarmed civilians, are not questioned by soldiers who may later be charged in civilian courts. Of course this applies not only to Ireland, but to all the military operations that Britain conducts in order as part of US-instigated illegal wars. Politically, it is vital to maintain the false propaganda regarding the military’s benign role. The Bloody Sunday murders were a long time in the making. The Ballymurphy massacre, in which 11 unarmed civilians were killed, took place 6 months earlier in August 1971 and was also carried out by the 1st Battalion of the Parachute Regiment. The Paras have never been a policing force and were deployed on Bloody Sunday amid numerous reports at the time from within the military that a major incident was in the offing. Before, during and after the attack British government propaganda claimed that the soldiers were likely to be or had been come under fire. This was the big lie of the Widgery Report, a white-wash amounting to little more than the army’s cover-story. This was the official position of British governments for 28 years, until the Saville Inquiry was published in 2010. Victims’ families and survivors have had to wait another nine years until a single soldier has been charged. Numerous British politicians, including the Defence Secretary are now clamouring for legal immunity for British soldiers, leaving them legally free to commit murders and other atrocities. By contrast, Jeremy Corbyn has argued for all the military and other personnel involved to face justice. Corbyn is right. Unionist politicians of all types have always claimed that the population of the north of Ireland are British, ‘just as British as Finchley’ in Margaret Thatcher’s words. This is evidently false. But those same politicians’ willingness to lie and cover for the murders of unarmed civilians under their jurisdiction should be a chilling reminder to all socialist and progressive forces about what the state is willing to do, and what they are willing to say, to crush popular movements demanding fundamental reforms. All socialist and democratic forces in this country have a vital self-interest in ending the injustices of the British state in Ireland.